One of our best-selling calla lily wedding favors! Elegant in design and fit for any occasion, these stunning calla lily candles will provide a romantic glow at your event! Standing 2 1/2" tall by 2 1/2" across, each clear glass holder includes a white tealight candle. The glass is wrapped with white textured paper and held in place with a white organza ribbon. The reception favors are each finished with a miniature bouquet of three artificial white calla lilies. Packaged in a clear gift box and tied with a white organza ribbon, each candle favor is finished with a matching "For You" tag. And here you have the Calla Lily candle by FashionCraft. Comes nicely wrapped in a plastic box with a little "for you" card. Has a nice little sheer organza fabric ribbon. I'll open it up and see what's inside. Hi! Since we cant personalize the candle holder, how many inches is the ribbon wrap around the box? Im planning to get personalized ribbon to replace it, so at least it has the wedding date and the bride and groom name. Thank u! The Calla Lily Design Wrapped Candle Favor is 2 1/2" tall so the ribbon should be around 3 to 4 inches or longer since you still need to tie it. Yes, we accept PayPal for payment. This candle favor looks awesome. If I understand correctly the size of the candle is 2.5X2.5. What is the size of the box that the candle comes in? I am interested in ordering personalized stickers for the boxes and wanted to know what the size was. How much lbs does this calla lilly wedding favor weighs? The Calla Lily Design Wrapped Candle Favors weighs 0.31 lbs. For the "Calla Lily Design Wrapped Candle Favor," do the candle holders come with the candle? 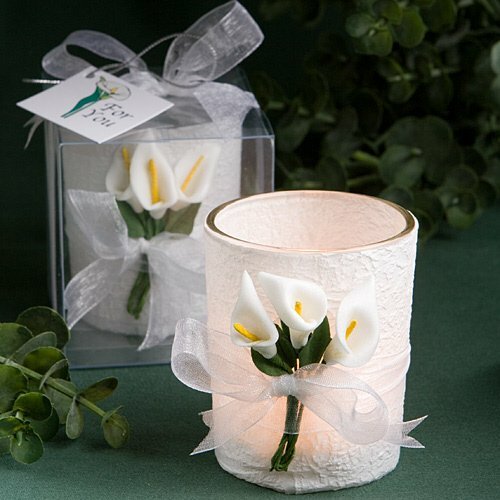 Yes, the Calla Lily Design Wrapped Candle Favor includes a white tealight candle. It's wrapped with white textured paper and held in place with a white organza ribbon. It's also packaged in a clear gift box and tied with a white organza ribbon. Each candle favor is finished with a matching "For You" tag. Am I able to add labels with info 25 years and our names on the Calla Lily candles? Unfortunately, the Calla Lily Design Wrapped Candle Favor can't be personalized but you can purchase a personalized tag separately here. Upon your response, I'll know to place my order immediately, or I may have to find something else (sadface). Again I can't be more clear on how much I adore these lil favors, and believe me they'll be the icing on my wedding cake! I await your response. Have a blessed filled day. Thanks for your inquiry! Yes, we do expect the Calla Lily Design Wrapped Candle Favors to be available on July 30, 2018. Hello, before I place an order for 215 candles, would this be guaranteed to arrive to me by July 26th? Please let me know, thank you!! Hi Esther. If the item is out-of-stock, like it is today, we can't guarantee when the candle will arrive. However, we have a lot of time before July 26th, so we feel 99.9% confident it'll get there on time. Place your order and indicate when your event date is. If we can't get it to you in time, we'll let you know and let you cancel it. But we feel pretty good.